Public speaking is present in nearly every aspect of business. Meetings with clients, promoters, partners and other companies require a great deal of speaking. This is true for both in person meetings and online meetings. Your orating skills factor into how well you get your message across. Public speaking is important for marketing, as well. If you prepare a presentation for an industry event, you will be face-to-face with hundreds of people. Speaking in public does not have to be the terrifying ordeal it appears to be. There are plenty of strategies for making it an effective business tool. If you are a business professional with a need to improve your orating skills, make use of the techniques laid out in this post. Here is a guide on learning how to speak in public. 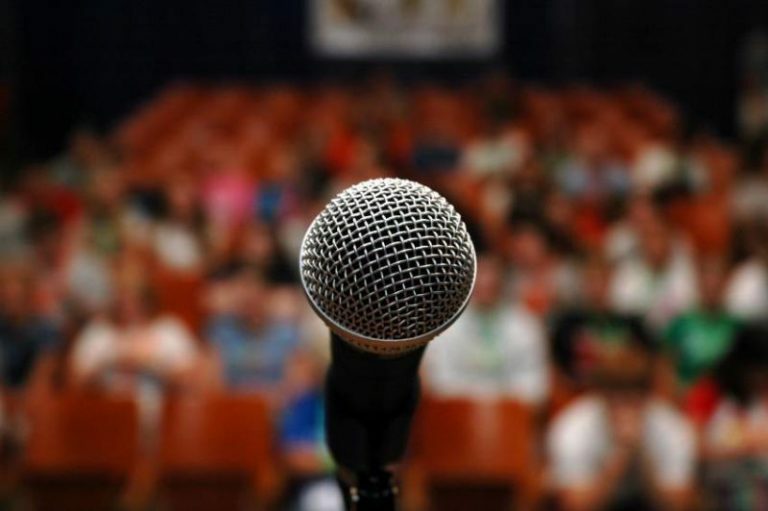 If you are having public speaking anxiety, you will ruin any chance you have at making an effective speech or presentation with your nerves, no matter how prepared you are. In order to avoid this, there is one simple trick you can use to help ease your fears. Admit to the audience that you are nervous. If you admit to your anxieties, you are better relating to your audience, who has surely experience fear of public speaking at some point in their lives. In addition, you are also preparing them to be more forgiving for any mistakes you make later on and helping to ease your own nerves. If you are nervous about public speaking, tell your audience that. You are sure to set yourself up for a much better speech. Making an audience laugh is one of the best ways to engage them, just ask anyone with a Donald Trump education. It lightens the mood and locks them in for further information. It may even help to make you more comfortable speaking in public. Note however, that jokes are a hit-or-miss affair. A failed attempt can make your situation infinitely worse. It is recommended that you test your jokes out beforehand. Gather an audience of friends or coworkers. Study their reactions and gauge how effective your bits are. If you are confident in your delivery, you can incorporate them into your presentation. Humor is an incredibly helpful tool for learning how to speak in public. If you have trouble speaking in public, you might have a tendency to drone on about superfluous details. This is detrimental to your efforts, as your audience is likely to lose to focus. You want to make sure they take in the important details. To accomplish this, try to stick to your key points. Simplify your presentation into a collection of vital facts. Then, time yourself. A good business presentation can relay all the necessary data in 30 minutes or less. As long as you practice focusing on key points, you can expect to become a better public speaker. Your audience will only be as enthusiastic as you are. That is why it is so important to sound as excited and enthusiastic as possible. Make use of hand gestures and enunciate. Change your cadence once in awhile, just as great sports analysts do. This will help you to emphasize key points. If you provide enough energy, your audience will send the energy right back. This is vitally important for engaging them throughout the presentation. Just make sure you keep it to a reasonable level. An excess of enthusiasm might end up having the opposite effect on audiences. Add a bit of enthusiasm if you need help learning how to speak in public. A lot of anxiety stems from having to memorize information. If you are not completely confident in your delivery, you may end up stumbling on a few points. This can be avoided by speaking from the heart. Relate to the information in a personal way. Share how you really feel about the subject. Your audience might be more inclined to listen. They may also find the information more interesting or reliable. If you are delivering your speech in a sincere manner, you are far less likely to trip over your words and ideas. Putting your real self out there is a great technique for learning how to speak in public. Public speaking is a daunting experience for most people. Fortunately, there are ways to improve as a public speaker after you have missed the opportunities presented by the public education system. You can try to be more genuine and speak from the heart. Reducing your reliance on prepared material can improve the flow in your presentation. You can also try to condense your presentation to its key points. You do not want audiences losing focus when you have not yet relayed your most important information. Practicing the techniques laid out in this post will expedite your efforts to learn how to speak in public.